Technomad recommends that Schedulon users visit The Freesound Project, a useful resource to access and download legal audio files. Looking for bell sounds or carillon tones or your school or church? Perhaps you need sound effects for football and baseball games, or background music for your office or store? Freesound offers a variety of licensed sounds to complement your environment or facility. Visit freesound.org and identify the sounds you want. Attribution: Others may copy, distribute, display and perform copyrighted work and derivative works, with credit given to the creator as requested. Share Alike: Others may distribute derivative works under an identical license to the governing license. Non-Commercial: Others may copy, distribute and perform copyrighted work and derivative works for non-commercial purposes. No Derivative Works: Others may copy, distribute, display and perform copyrighted work verbatim, but not derivative works. Based on the above licenses, most available sounds can be used for non-profit organizations such as schools, churches and municipal-based public services (such as parks and recreational facilities). Businesses can also take advantage of any sounds that are not tagged as non-commercial works. 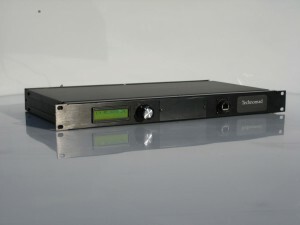 The Schedulon provides storage for an unlimited number of sounds (2GB standard memory). Once uploaded, sounds are available for immediate on-demand playback from a front-panel, push-and-turn knob. Audio files can be assigned to any of the 99 available knob positions. Users can also create schedules for automatic playback. Scheduling can be as straightforward or complex as desired, down to the exact time of day, from single-event playback to continuously repeated messages. Sounds and audio files can also be added to a precise, user-defined playback schedule based on an internal clock or synchronized network time server. Please visit https://www.technomad.com/products/schedulon/ for more information.